Bluefish are not the staple they had been not long ago in the summer. There are plenty of schoolie bass in the Sound but they can be inconsistent in the warm water. There are big bass on the reefs, that of course isn't an option available to everybody. Bonito have all but vanished in the last six year, maybe more, especially in the western Sound. But there are, indeed, alternatives for summer saltwater fly fishing. One just has to be willing to think outside the box, and be willing to fish for a few of the species that many don't consider worth targeting. Yesterday Noah and I went hunting for some of these fish. It was cloudy, muggy, and almost dead calm. I wasn't ruling out the potential for big stripers, or bluefish, as the area we were fishing has a tendency to hold them both even when other close-by locales don't. Schoolies and small cocktail blues were virtually assured. We started out by cruising the very outside edge of a big flat. The fish I was expecting to encounter there is also one of my favorite alternative summer targets: sea robins. Outside of sight casting on the flats, they aren't particularly fun for an experienced angler. But they really don't deserve their reputation, nor to be called ugly. I think they are adorable. But most who encounter sea robins don't do so on the flats. Having them follow me around like puppies, and take clousers presented literally on my foot very quickly got them a place in my heart. Yeah, they are easy to fool, but any sight fishing opportunity presented should be taken as it provides some of the most significant insights into fish behavior, and no matter how daft you target is there is no better alternative than practicing dropping a fly the correct distance and angle in front of a living fish. This evening was odd. I saw numerous sea robins roll at the surface and bust on silversides but on the initial pass of the flat I didn't see even one in the water. I did, however, catch a bass. The next move was to work a rip where massive amounts of silversides and bay anchovies congregate, as well as typical Northeast species like blues, albies, and bonito. Odd fish show up there too though, and that is our reason for fishing it. Spanish mackerel, jacks, ladyfish, triggerfish... nothing is really a surprise there. Today oddballs were lacking. So were bluefish, but they were around. A handful of bergalls, a scup, and a blue... now I was building a species list. The bergall photographed was from a different outing, but fits the size of the three I got today. When you're hoping for a banded rudderfish photographing a cunner is not a priority. Porgies are virtually everywhere in the Sound, and they are a really good alternative target for fly rodders in the summer. Fishing porgies on the fly often means long light leaders and heavy, heavy flies. I often circumnavigate the system and use either a fly tied on a jig or a drop shot rig. If I can chuck and duck it with a fly rod without risking snapping it, I will use it for porgies and black seabass. Don't get stuck in convention, this method is no less fly fishing than Euro-nymphing methods. Next, we fished a can and a rockpile. Small fish often congregate on cans, and they can be a hotbed of odd species. Unfortunately the one we visited today was not a producer, but it could be in as little as a week or two. So. Back to the flat it was. Sight fishing with clouds and a very low sun is not easy, but fish like sea robins will hold position until you are almost on top of them before they spook so much they won't take a fly or jig, so we still had some advantage. That there was a lot of surface play was also t our advantage, we could see where fish were working from far off. Sea robins don't always give you that option. Neither do skates. But when one is very brightly colored and lets you roll right up over it's noggin, unless you are paying no attention to the things you should be you are probably going to see it. When I spotted an orange and pink diamond shape with spots plastered on the sand I knew exactly what I was seeing and new I wanted to catch that sucker. I knew staying in the kayak which was drifting quickly down flat as not a good option, so I ditched it. I followed the fish, dropping my clouser in its path, and eventually got it to take. While I hooked the fish and started the fight Noah wrangled my kayak. I then retrieved it and walked both the skate and my kayak up onto the sand bar for a quick photo shoot. That was the highlight of the day for me. Skates on the fly are not common. This is my second, same species as the first: clearnose skate, Raja eglanteria. It was followed by a brief burst of sea robin activity, in which both Noah and myself hooked and landed one, then a lull as darkness fell. My last fish of the day was another bass, Noah's was a near legal fluke. Our species count was exceptional. I've fished some streams over the last week. All very different. One high gradient with a few waterfalls and bedrock bottom. One low gradient with long slow glides and a few deep bends. One with tons of classic pocket water. And one big one whose waters are drawn from a huge deep reservoir. Though each of these streams looks and fishes differently, they all have one particular thing in common: wild brook trout reside in their waters. In the thralls of summer brook trout never fail to save the day when browns and rainbows refuse to. Brook trout, be they in water big or small, slow or swift, anywhere I have fished to them, love the Ausable Bomber. The lovely girl above took a bomber being stripped quickly downstream a deep flat pool just before dark. The same technique duped a larger male a couple casts later. Unfortunately I wasn't able to bring him to hand. Mike Carl and I fished together this morning, and conditions were perfect for fishing being streamers. Something was off for me though. I missed fish after fish after fish. They weren't love taps either, many of these fish visibly fully engulfed the streamer, some hitting so hard the rod jolted. I must have missed four browns over 20 inches in length, a couple of them more than once. Some days I just can't seal the deal. To make up for it, while tromping up a side channel I spotted a splashy rise at the edge. I put my big royal stimulator on his plated and he munched it up greedily. It was a handsome wild brookie, one of the better I've landed in this river. Despite missing numerous fish and some exceptionally monsterous ones, I did manage a "Grand Slam" of sorts with a brookie, some browns on the streamer, and a rainbow and a salmon parr on a black caddis. July is just about over. I'm OK with that. It has never been a favorite month. Here's hoping that August will bring big stripers, carp galore, and maybe a few of the browns I encountered this morning brought to hand. I'm sure some new species will be checked off by the end of August. Not all that eat nymphs are trout. If I had one recommendation for multi-species fly fisherman, it would be to learn the ways of the nymph, as in depth as possible. My biggest largemouth? Nymph eater, bigger than 8lbs. Most of my biggest fly rod smallies? Nymph eaters. Fly carping without an understanding of aquatic insects and how to fish nymphs isn't going to yield great results. My best bowfin ate a dragonfly nymph. When I'm trying to catch a new species in freshwater, odds are knowing a thing or two about nymphing is going to help. That being said, I don't think you need to fish nymphs for pike. And yet, while hoping for smallmouth and catfish a few nights ago, that skinny little gator up there at my Hare's Ear in 10 feet of water. Not what I expected. I would have been less surprised to get a hogchoker, a flatfish I'd encountered there in the past via netting baitfish. I alternated between fishing just an artificial fly and fishing one with a worm on it. I would not be so silly as to call the latter fly fishing, but even when I fish bait a lot of the time it is a fly rod that I use to do it. I feel I learn much from it, dirty though it may be. Tonight the fly only took that small pike. Live bait won out. No surprise. Smallmouth, bluegill, American eel, channel catfish, and white catfish all were duped by the old standby of baits. After dark the whiteflies came out. It was a hatch spinnerfall combo, and these bugs did something I hadn't seen: they molted into their spinner form on the water instead of in the brush, leaving little dun husks all over the surface. The lack of rise activity told me they were pretty safe doing this. Were it the Housatonic the smallies would have been all over those molting duns. This photo in every way represents what catching eels on hook and line is like. It stops being fun almost immediately. Well after dark I heard and saw some of a fish jump very much unlike ones I have seen before in the river, namely carp. This one, I am almost certain, was a sturgeon. I have seen one in the water in the past but it has been a while. I'll leave you with some catfish slapping fun. I think this little guy has been lipped once or twice before. He knew were to throw his tail. I've fished a place or two on the East Coast. South Florida. New Jersey. Cape Cod. Been by few other that I didn't get to fish. The Chesapeake. Georgia. I had never been any place quite like the Maine shoreline. It was a pretty foreign environment for this anger. The mixture of excessively clear and deep water filled with yellow and green weeds, dark metamorphic rock ledges, pine trees, and even views that included both lighthouses, sailboats, and mountains... it was a lot to take in. We found access to be less than common. Good launches far between. But we got to fish basically all the water we wanted. What I wasn't prepared for was how minimal the biomass seemed overall. There were large areas where there simply weren't fish. Small bait was, for the most part, as limited as I'd ever seen anywhere. Finding fish was a legitimate task. Not super difficult, but more so than I expected. The first takers we found on Saturday morning were residing on a point on the down tide side of a dock. They were bergals. The takes were numerous but my hookup percentage was downright lousy. Bergals weren't the only fish in the neighborhood. There were menhaden and stripers, but the stripers were far too spread out to be much worth our effort. We continued north and east to Boothbay. There, we found a couple of upside down seals, immense bunker schools, and something we were actually looking for. Atlantic mackerel. A feisty little fish, much like a snapper bluefish in behavior and the water the occupy, Atlantic mackerel are a baitfish of importance for striped bass in bluefish from the Cape well into Canada. To Noah and I both, the were another species on the list. This one topped me off at 79. I didn't realize at the time that I was so close to topping 80. Seeing as I am writing about this trip, I already know the answer to whether I would get to within 20 of triple digits, but I'll leave it up to you, dear reader, to guess if I did and what my 80th species or hybrid may be. By late afternoon we had found ourselves in Rockland, fishing a long breakwater that would give use a good ol' fashioned skunking. There were other anglers there and we did see fish caught. The only angler we saw catch fish was using a float for mackerel. That was a method I had heard of but never seen used in saltwater. Later, with the sun setting fast, I hunted for stripers on the bay while Noah took a nap. I found one that engaged with my fly but didn't eat. Later, after I got back to the dock, Noah got a fish that surprised both of us: a river herring. Which species it was is uncertain, but for him either way it would be a new species. Surprising though that herring was, it was far from the most unusual thing this coastal tour would throw our way. Noah and I launched in a tidal river not terribly unlike ones we launch in that dump into Long Island Sound. Except that the water was almost disturbingly clear and would loose more water in half of the ebb than a CT tidal creek would on a the same tide. We were going to be searching for new species in water we had never been to before. We were starting in a place immensely important in fishing history: Gloucester Massachusetts. We have a harbors in Connecticut. We have some commercial fishing. But for Noah and I, fishing busy ports full of lobster, tuna, and swordfish boats was a new game. We didn't really know exactly what we'd get, but this trip was going to revolve primarily around Atlantic mackerel and harbor pollock, with some striper targeting on the side. Gloucester was not a stop we planned on initially. We realized we likely wouldn't get into Maine early enough to have fishing time on Friday night so we made the call to stop in Massachusetts. We didn't catch anything there, but we kayaked past a lot of History. We kayaked by the Fisherman's Memorial, inscribed "They that go down to the sea in ships". The North Atlantic is a dangerous place and has swallowed fisherman whole, some never to be spit back out. We were safe inshore and well prepared for rough conditions, something the harbor masters were good enough to check. But the Ocean was out there, and like it always does it called to me. Someday. Noah had a hit on a kastmaster, probably a mackerel. I had a hit on a chartreuse and white deceiver. Definitely a striper. When you're fishing new water there are I always try to chat with other anglers I meet. I never ask for spots, what to use, anything like that. If someone is going to be forthcoming with information I'll take what they are willing to give me. I find I learn more useful stuff by watching what other anglers are doing and listening to what information they feel is fair to give out. There were a few anglers fishing together form on of the docks there in Gloucester, chumming little bits of what were presumably the few mackerel they were catching and free lining chunks for stripers and more mackerel. They were hooking fish pretty consistently, and seeing as the only activity we could see anywhere around was right there we were hanging around in fairly close but appropriate proximity. We talked a bit, they said their were some mackerel and stripers moving through, and even though they were chumming and I would expect that to result in schools hanging out right there the amount they were hooking up and the behavior of the small peanut bunker adjacent to that dock lead me to believe that was exactly right, the fish were moving. We also talked about fly fishing, and though I didn't expect them to know fly fishing one clearly did and we talked a bit about big stripers. His biggest on fly had ten inches on mine (37"). Never, ever think you can't learn from a conventional angler if you are a fly caster, or that you can't learn from a bait fisherman if you only fish artificials. As much as I learn talking to other fly fisherman I usually learn more from surf casters, bass fisherman, and bait fisherman. And that is in large part because I strive to do things with a fly rod that have never been done before (more on things that have never been done before soon). Noah and I made it to the spot where we were going to spend the night and found a southern Maine sand eel 'hatch', beach structure I'd never seen the likes of, and a bite I couldn't have been quite put my finger on. While we were taking our gear off a surf caster whose light I had seen way out on the sandbar walked past. We exchanged hellos. Then I asked if he had caught anything. He didn't reply. I'm not sure. Maybe he was just pretending not to hear me, or maybe he really didn't. But I think I know. I think he knew exactly what was going on and where he had to be. It is smart to keep your cards close these days. But sometimes silence speaks more than anything else. Be careful. Share only the things that are important with those who you are certain you can trust. And no, where the big stripers are right now is not what's important. The next day we'd fish spots all over a long stretch of the Maine coast. We'd learn a lot. Catch some new fish. See things we'd never seen before. You know what? That's what's most important in fishing. July is the slow month for many that chase striped bass with a fly rod in Long Island Sound. Big fish are mostly out of reach in both depth and distance, small fish are inshore on the surface somewhat less, and the fishing is pushed to darker conditions. There's still some sight fishing to be done but it just isn't what June was. It is a grind till the new moon in August. But if you play the game you still have a chance of finding something special. Last night, after grinding for hours, Noah and I found something quite special. We were headed in after a slow bluefish hunt, nothing substantial caught by either of us, and after rounding the point I could have sworn I saw a few splashes a long way down the shoreline between me and a secondary point. I continued at the same pace. It was probably just a herring gull taking off. I got much further and saw another splash between myself and a dark patch of water. OK, that was a fish. But all alone out in the middle of nowhere. Not a viable target. Then, all too suddenly, it became clear that the dark water wasn't just an effect of wind and light. 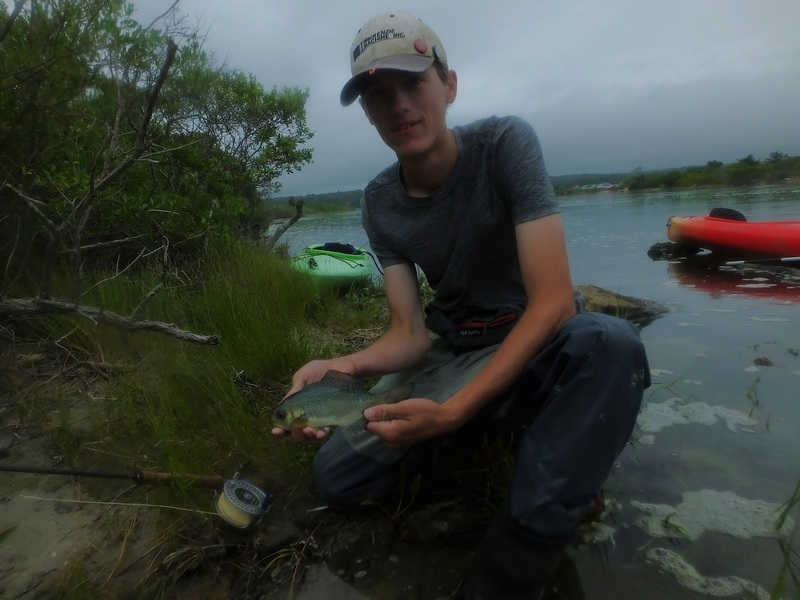 It was nervous water, nervous water in which hundreds and hundreds of striped bass were feeding heavily on rain bait. When the fish let us get close enough we were treated to a show. There were soooo many bass in there, and for the most part they were gently slurping up the small bait just inches under the surface. The larger ones in the school rose like trout to emergers, showing the tops of their heads and a bit of their fins just ever so briefly. It was beautiful. We caught a few of them. All it took was putting something with a slim profile right in that nervous water and giving it a little twitch. I've fished for striped bass consistently for three years now. I am absolutely infatuated with these fish. Big. It just doesn't matter. I love striped bass more than life itself. And it kills me to know I came a bit too late and that this fishery is not only a fraction of what it was just 15 years ago but also getting worse. I don't take one moment in a situation like this for granted, because I don't know when the next time I'll see it again is. It'll happen, for sure. But undoubtedly less than my soul needs it to.